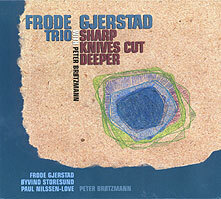 Frode Gjerstad, alto saxophone, clarinets; Øyvind Storesund, acoustic bass; Paal Nilssen-Love, drums; Peter Brötzmann, tenor saxophone, tarogato, clarinets. Recorded on 22 December 2001 at Lille Konsertsal, Stavanger, Norway. Front cover photograph (reproduced above) by Camilla Sørvik; graphic design by Luigi Naro.